"Excellent Value for your money very close to airport and mal..."
Have a question for Tenzai Pension House? "The staff are very friendly." "The room was very simple and very clean." 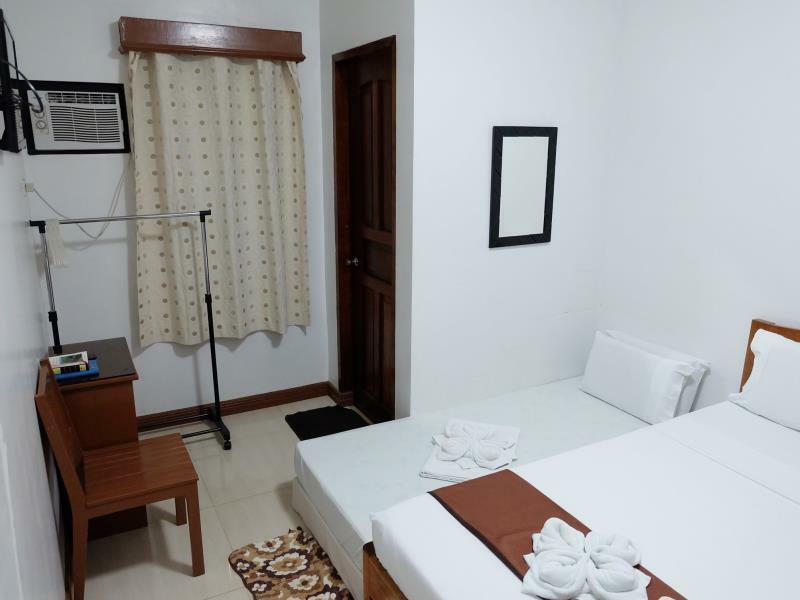 "Clean rooms, very hospitable staffs"
Built in 2012, Tenzai Pension House is a distinct addition to Palawan and a smart choice for travelers. From here, guests can enjoy easy access to all that the lively city has to offer. 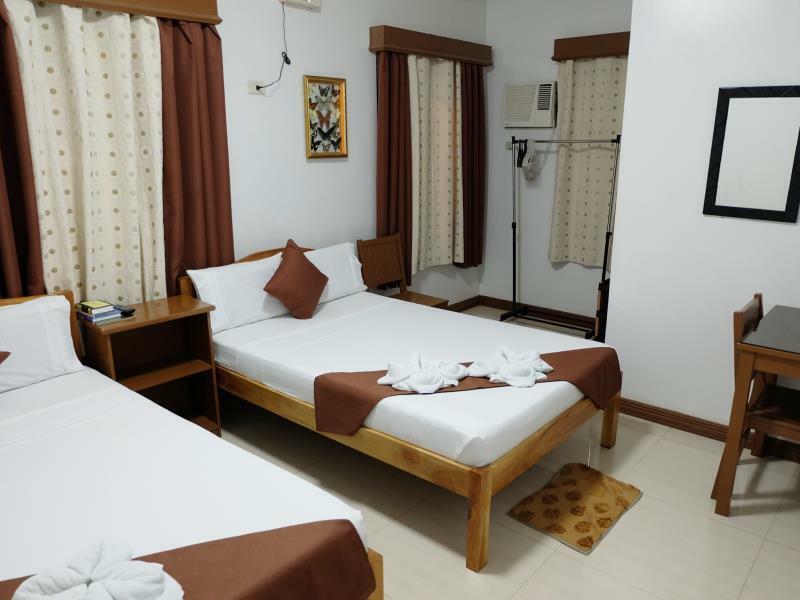 For sightseeing options and local attractions, one need not look far as the hotel enjoys close proximity to Puerto princesa city colesium, Puerto Princesa Airport, Robinson's Place Puerto Princesa. 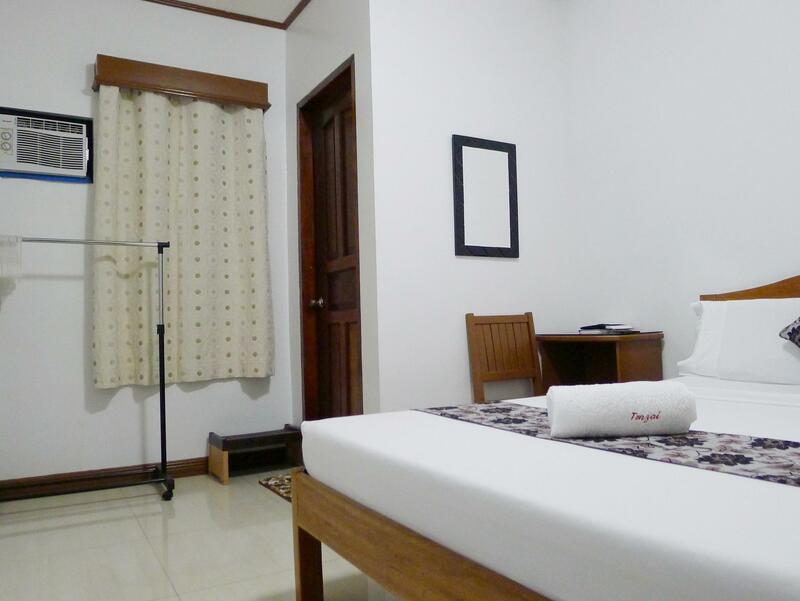 Offering hotel guests superior services and a broad range of amenities, Tenzai Pension House is committed to ensuring that your stay is as comfortable as possible. Top features of the hotel include free Wi-Fi in all rooms, Wi-Fi in public areas, room service, airport transfer, family room. All guest accommodations feature thoughtful amenities to ensure an unparalleled sense of comfort. The hotel offers wonderful recreational facilities such as massage, garden to make your stay truly unforgettable. 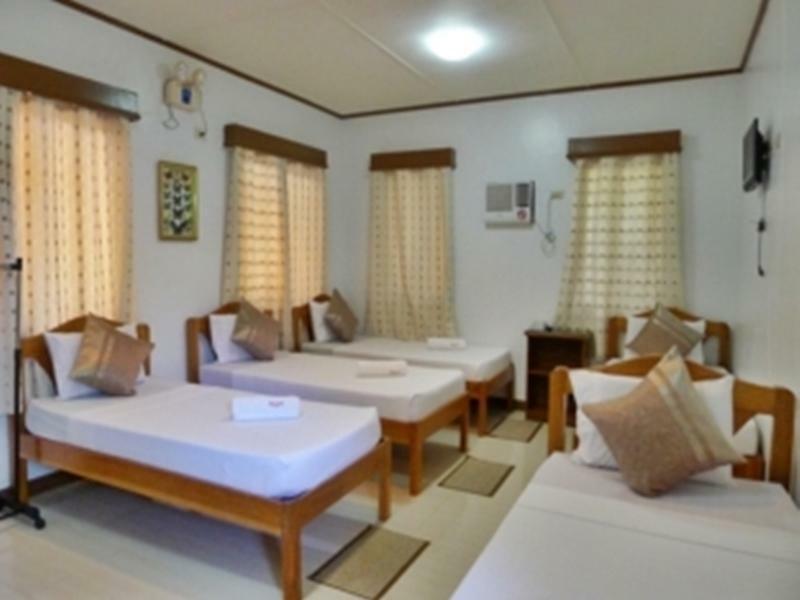 Whatever your purpose of visit, Tenzai Pension House is an excellent choice for your stay in Palawan. "Accesibility, neatness and friendly staff, an at-home atmosp..."
The property provides a pick-up service from the airport. Please provide your estimated time of arrival in the “Special Request” section upon booking. Great place to stay not to far away. had to ride tricycle though. Worth the money the room is equip with everything you need the lobby though has alot of mosquitos and we had free breakfast for two you can smoke outside. really worth it for 900 pesos per night for two. For the basic necessities, they have it all. Warm water, clean beds and sheets, free drinking water and breakfast included. They even offer laundry service for a great price. A good little place close to the airport. Breakfast was awful — but all breakfasts were awful in the Ph (crap toast + egg + crap coffee). Nice, helpful staff. Loud airconditioner. Garden in middle of very small grounds. Excellent Value for your money very close to airport and malls for trike ride of 50 - 70 pesos. Free airport transfer after I wondered about it. I shall definitely return if the price goes down a bit but still great value overall and super comfortable for a vacation. Friendly staff despite late check in. Room was quite cosy, amenities consist of TV, air con, and hot water in the bathroom. On the next day following quick breakfast we were offered free transport to the airport. Located just 6 mins away. Check in a bit slowly,very clean room,breakfast filipino only,so only rice,a kind of sausage/porkmeat and egg and coffe or powdered juice.most of trikes wont bring u to town,or rip u off.lot of mosquito becos a little garden surround by 8 rooms.i give it a 7 not more.its fir filipino s.
The first time I stayed here was in 2016. I liked it then, so I decided to stay again this time. This place has almost everything you need: free airport transfer, free breakfast, it's close to the airport, close to malls (SM and robinsons are 10 pesos per person on a regular fare tricycle). It also arranges tours and van transfers to other areas of Palawan. It's got a water dispenser where you can get free water. The staff is nice and friendly with beautiful smiles. Rooms are very basic but clean. Aircon works but I wish it could get colder. Toilet works perfectly. Water pressure from the shower is still weak, so you might need to use the bucket and dipper. No shower curtain to separate the shower and toilet, so the toilet area gets wet when you shower, but it dries pretty quickly without having to mop it. Bed sheets are hospital thin, but I guess you don't need thick sheets when the room doesn't get too cold anyway. We stayed 2 nights at Tenzai and we had wonderful stay. We will definitely come back to this lodging site. The staff are very accommodating. Breakfast and airport transfers are included in the rates. Breakfast is okay. The hotel is very near (around 5 minutes) the Puerto Princesa airport but a little bit far to the City Center (around 20-30 minutes). I will definitely recommend this hotel to friends and relatives. Thank you Tenzai for your hospitality. We booked an overnight stay so that we can rest for our first trip to ElNido in the morning. They have free airport transfer and they welcomed us nicely! It comes with a free breakfast as well. Room and bathroom was clean. It was near the Tajmaki restaurant that is open 24hrs to eat dinner. Overall, it was pleasant stay in Puerto Princesa! Small and clean guesthouse, a bit far from the city centre and everything. Breakfast was terrible (3 slices of white bread with nothing to put on and an egg) and staff is not really nice and helpful. It’s quite cheap though and they do offer free shuttle to the airport. In general, I don’t understand why they have such a good grade. I only spent 7 hours in this pension house. I arrived late from El Nido, however, check in was still available and very easy. I stayed in room 1 next to the front desk. The room was very simple and very clean. However, my only concern is the air-conditioning. The room is so small but no matter what I did, it didn't leave the room not even close to cool. I think this would become a problem in the summer. All in all it was a convenient stay as i needed to be in the airport by 6:45am. They offer free transfers to the airport and back so that's a great plus! They are 10-15 minutes away from the airport by foot. It's a great value for the money and the staff is very accommodating. We had a minor problem with the water not draining when taking a shower, but, a quick call to maintenance and the matter was quickly resolved. Free breakfast accompanied each day we stayed. Be forewarned, they do not serve food apart from the included complimentary breakfast. There's no mini-ref inside the room either, so be sure to bring in your own bottled water and other snacks. The only downside is its location, it's away from the hustle n bustle of daily traffic, but, the side street getting to the Tenzai House is NOT paved. When it rains, that side street will get muddy. There was a little bit of confusion at the beginning as they forgot to pick us up at the airport. Over all we had a really nice stay. the staff are very nice and are very attentive, very clean rooms and very near the places you might need to go. High recommended. a good clean simple place with a friendly staff. Not easy to find at first but convenient transportation is very close. Really close to the airport. They provided us with a free early morning transfer. The rooms are clean and have a fantastic shower. The staff went out of their way to ensure we were happy. I booked this place because it was inexpensive & close to a place I needed to visit. The free breakfast was just icing on the cake. When I got there they were preparing to go to the airport to get me. I wasn't expecting that, but I missed an email from them. The room was clean. The bed was comfortable. I got a nice hot shower. The location is close to downtown & the outlying Robinson's Mall. The setting is very quiet. All the employees were kind & helpful. The breakfast was good & filling. I didn't use the TV or the WiFi, but they were available. We stayed here for just the one night after arriving into Puerto Princesa. It was a cute little place, had aircon and decent wifi. Staff made our breakfast in the morning which was basic but not bad when it's included in the price. Good value for money! I got free breakfast and free airport transfer when stay at this place.. That have also a kitchen to be used for cook.. And then the owner and staff are so nice.. The place also nice with a garden.. I just love to stay here..